Today’s environments call for not only effective but creative use of space, and banquette seating is the perfect collaborative furniture solution. AGATI answers this call with our sophisticated Hampton Banquette Seating. The basic Hampton Banquette is a great seating choice for casual and open spaces. Noisy, high traffic spaces are no match for a collaborative study session with banquette seating in your library. 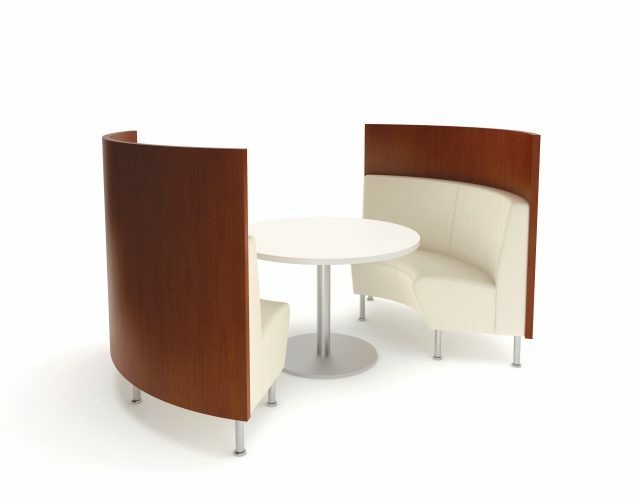 The Hampton Banquette easily eliminates surrounding traffic distractions – optional surrounds can be added to envelop users for more seclusion. Both the curved and straight Hampton banquette seating options can be covered in chic fabrics, backed in sleek veneers or upholstered screens. Collaborative library furniture never looked so good, and your students will thank you. Interested in a quote for your own Hampton Banquette? Let us know by sending us a message below! Collaborative library furniture looks different for each university or public library scouring the internet for their perfect solution. What remains important is that collaborative library furniture allows groups of two or more people to cohesively work together with a greater ability to focus and complete any tasks they have on their to-do list. For some, collaborative library furniture means a banquette with fabric surrounds. For a small group of students in a university library, a banquette can be extremely helpful. University libraries are constantly buzzing with students running from class to class, which means noise levels can be a bit louder than other spots on campus. Students looking for a little bit of quiet space to work on a group project benefit from banquettes – the curved seat allows students to sit together without having to find an extra seat while the fabric surrounds dim the external noise.